The most popular steel substrates in the metal roofing and siding industry are Galvanized and Galvalume. Galvanized substrates are coated in zinc, while Galvalume substrates are coated with an alloy of zinc plus aluminum. Both Galvalume and Galvanized are good substrates for metal panels. For most applications, Galvalume substrates offer the best long-term solution, and Galvalume's superior performance has been proven in the field. 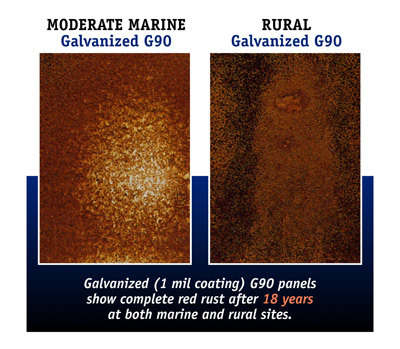 Over four decades of testing has shown that Galvalume delivers superior corrosion resistance compared to Galvanized panels. In fact, Galvalume's performance in the construction industry has been so superior, that steel mills warranty it against rupture, perforation, or failure due to corrosion. Similar warranties do not exist for Galvanized. In one test, unpainted Galvalume and Galvanized panels were placed in four different types of outdoor environments, including normal marine and a rural setting. The harsher the surroundings, the better Galvalume performed. 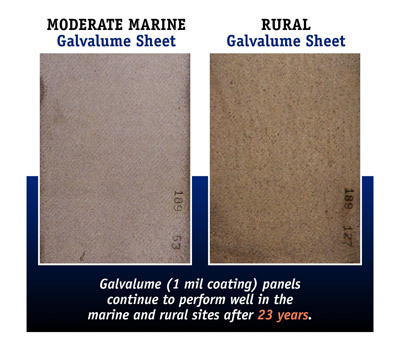 After 23 years of side-by-side comparison in all areas, Galvalume was two to four times more durable than Galvanized. The coating system, or paint, for metal panels is just as important as the substrate. For the life of the panel, the surface, or coating, will be exposed to environmental elements - ultraviolet sun rays, acid rain, dirt, etc. Over time, these environmental conditions will break down the coating resulting in panel fade and chalk. Fade and chalk are not pleasing to the eye, and the degree of fade and chalk is directly related to the coating system. The most popular coatings for metal panels are Kynar 500 (PVDF), Silicone Modified Polyester (SMP) and Polyester. Of the three, Kynar 500 (PVDF) coatings provide the best protection against fade and chalk and are proven to provide the best long-term performance. Kynar 500 (PVDF) coatings are the best for a long service life, color retention, and chalk resistance. Selecting Kynar 500 (PVDF) means long-lasting “like new” appearance year-after-year versus Silicone Modified Polyester (SMP) coatings, which can begin to degrade and look aged after only a few years. Both Kynar 500 (PVDF) and Silicone Modified Polyester (SMP) panels were installed on this project in Louisiana. On day one, the colors were identical. The above photo, taken eight (8) years later shows fading and chalking of the now lighter SMP panels. Note, no fade or chalking on the darker Kynar 500 (PVDF) panels. 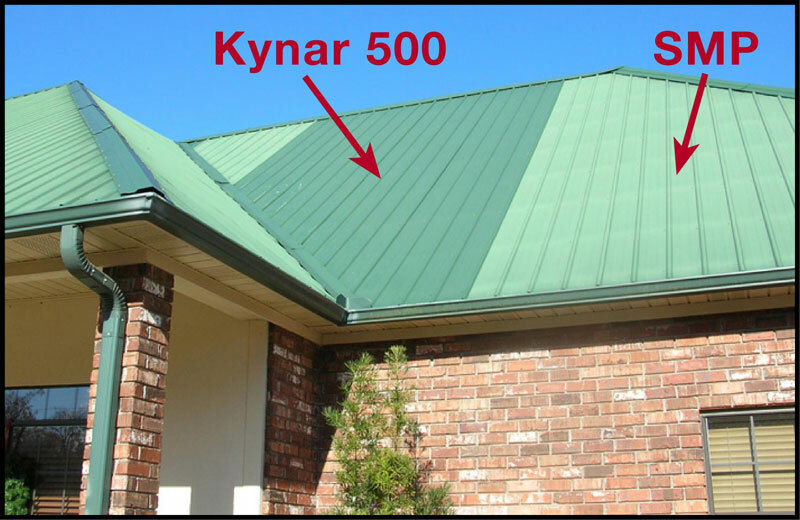 The building below dramatically illustrates Kynar 500’s superior performance. This building was built in two phases, nine (9) years apart. Note, no color difference in the two halves of the roof. No Fade! No Chalk!